Vinnie Ferrone | Live entertainment. 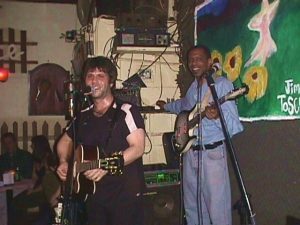 Vinnie Ferrone: Live Music in the Tri-State Area! Vinnie Ferrone & Mark West at The Back Fence in NYC. Born and raised in Newark, N. J., Vinnie Ferrone is a singer-songwriter who developed a love for melody and harmony as part of a boy’s choir. Over the years, he has compiled a repertoire in excess of 1200 songs, 200 of which are original compositions (that are all committed to memory and played straight from the heart.) Vinnie is a multi-instrumentalist (guitar-piano-bass-mandolin-harmonica-tenor & alto saxophone) who has logged many hours as a studio and stage musician, for other artists. During the past 12 years, he has performed more than 3,500 gigs, in more than 230 venues all over the tri-state area, (as well as in Nashville, Miami, the Dominican Republic and Bermuda), and logged more than 10,000 hours as a stage performer, singing in excess of 120,000 songs, over the course of these performances. With an uncanny vocal ability to conjure up the spirit and sound of the singers whose songs he discriminatingly chooses to cover, his passionate and honest performances have garnered him the reputation of a ‘one man band.’ However, he also leads a NYC based, three-piece band…The Vinnie Ferrone Trio.